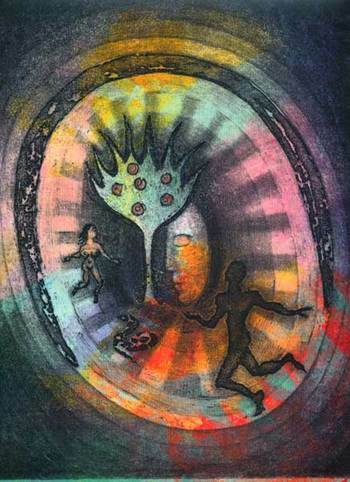 Etching from a limited edition artist’s book, The Creation from the Book of Enoch: “And Adam was five and a half hours in paradise.” by Natalie d’Arbeloff of Blaugustine. Astonishing. I can’t imagine an etching more in the spirit of Enoch – or closer to my own private conception of paradise. Adam as dark energy against a kaleidoscopic mandala is perfect. Natalie, this is stunning. Thank you. Dave’s right: it *is* astonishing. Wonderful, wonderful colors behind that black, Natalie! In this etching, it seems we are no longer waiting. The burst has occurred. Can I echo the word astonishing? Thank you all. I was cheating a bit as this work dates from 1992 and contributions to qarrtsiluni are supposed to be of recent work. But I hope I can be excused because I felt that this image fits the theme. And the “five and half hours” seems to me like waiting for the end of paradise. Does anyone know the origin or real meaning of those words? The Book of Enoch’s account of the creation is so fascinating and full of mysterious phrases. That’s what stimulated me to illustrate part of it. I love all your work, Natalie, but this is mandala form and it is extremely meaningful to me personaly. Wow. I think something in my head just burst. Or my soul. Amazing and wonderful. Thanks, Natalie. Gorgeous. I love the movement in this. Yes, the movement … it has me spinning in a galaxy of color! Wow! Visions of enlightened journeys though time and space. Thanks for the wonderful experience Natalie. wow, i love the cyclical movement and the evergrowing bands of colours and the man running throught the tracks. i love the story you are telling through this. great work natalie!